All Artists must be nineteen (19) years of age or older to enter. All Artists must perform and compete on behalf of only one band. All Artists must be a regularly performing member of the band prior to contest, Artist’s must remain the same; no substitutes or additions are allowed during the contest. Each band must complete an Official Registration form with $25.00 Refundable Deposit. * Deposit is forfeit if booking date canceled. 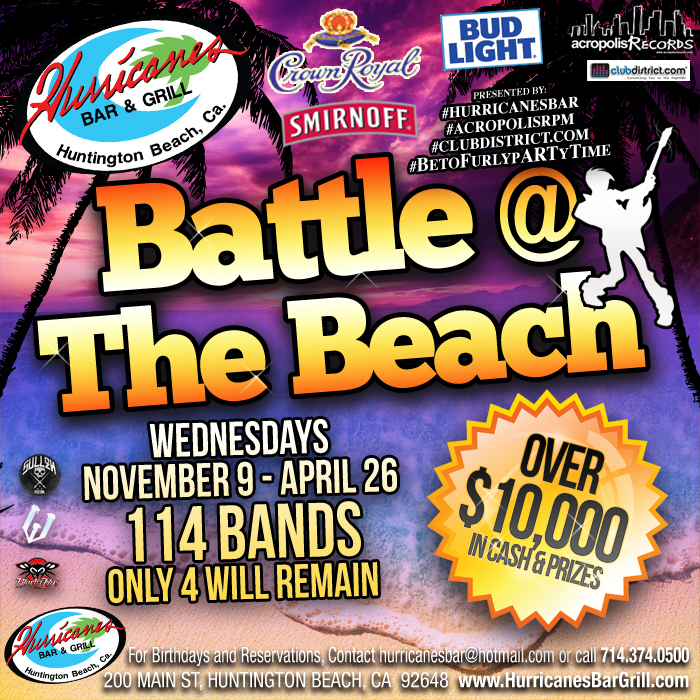 At a minimum, one band member must retain residency within a 75 mile radius of Huntington Beach, CA. Music genre will be open format. Submittals will be reviewed for appropriate genre. Bands are required to provide all marketing and promotional materials for their group, including at a minimum a high resolution band photo and biography. All Artist’s names and details must be listed on the entry form at the time of registration, anyone not listed will not be eligible. In the unfortunate event any member of a band is not eligible or is disqualified, then the entire band is subject to disqualification. Bands are encouraged to promote the event amongst their fans as crowd reaction and applause is a factor in judging. * deposit will be refunded immediately after performance. Each band will select one (1) representative who shall have full legal authority to act on behalf of the band. This representative will be the sole contact person for the band related to this contest. All Artists and Representatives should carefully review the Official Rules of the contest. All registration materials, band photo and biography must be completed and submitted prior to the entry deadline. The final entry deadline is March 22, 2017 at 12 noon. Registration materials from bands will be reviewed and the bands invited to play will be notified within two weeks of receiving their application. Creative Materials may not contain “sampling” from other songs, music, sound effects, or any other elements in which the Artists do not have the necessary rights to, title and interest, including copyright. Creative Materials and band names must be kept in line with Hurricanes Bar & Grill, Inc. positive image. Hurricanes Bar & Grill, Inc. has absolute discretion, without limitation, to determine if Creative Materials or Artists names contain offensive or defamatory items. If any such material is present, the Artist will be disqualified. The show will take place in the Stage Area. Hurricanes Bar & Grill encourages the artist to bring their fans to be members of the audience. One of the judging areas is Crowd Reactions/Applause. Bring your fans! Admission to the show will be FREE. Band members will be limited to not to exceed 5 members, one (1) tech and one (1) manager or support staff. Bands may play original or cover songs, with proper copyrighted permissions, but must be able to perform a minimum of 25 minutes’ worth of material, the minimum amount of time could be increased; however it will not exceed 35 minutes. The doors of the venue will open at 11am. The first band will take the stage at 830pm. The bands will be randomly assigned a time slot. The bands representative must be present at 7:30pm at the stage for their stage time. All entrants will be placed in drum and a time slot will be selected. The event will end pending the number of entries however; this time will not exceed 11:30pm. At the conclusion of the event, or 11:30pm, whichever comes first, tabulation of the scores will commence. Bands will be judged on a rubric at the conclusion of their session. This is used to ensure fair and equal judging off all bands. The judging panel will include three judges, one judge will have a musical background, the others two will be selected by AcropolisRPM and Hurricanes Bar & Grill, Inc.
A member of AcropolisRPM will collect the score cards from each judge at the conclusion of the bands set and secure them for tabulation. Bands going over the time limit will have ten (10) points deducted from their total score for every one (1) minute they go over the maximum allotted time. The band is responsible for the timing of their set, AcropolisRPM and Hurricanes Bar & Grill, Inc will not notify the band that they are over or under allotted time (note the exception in rule #8). However a representative will keep track for scoring purposes. A representative of AcropolisRPM and Hurricanes Bar & Grill has the authority to remove the band from the stage due to any item(s) deemed inappropriate or unprofessional. AcropolisRPM & Hurricanes Bar & Grill, Inc has the authority to place a hard stop and remove the band from the stage if they go over their allotted maximum time by five (5) or more minutes. If this action happens the band will be disqualified from the contest. Four Hundred Fifty (450) maximum points are possible (one hundred fifty (150) points from each judge). In the event of a tie, the judges’ score cards will be reviewed. The band with the highest score in the Talent category will be awarded the grand prize winner. At the conclusion of the event and tabulation of all scores, a member of AcropolisRPM and Hurricanes Bar & Grill will announce the winner on April 26, 2017 after the Final Band Performance at Hurricanes Bar & Grill. Tuning – were the instruments and equipment made ready prior to performance? Did the band start on time? Evidence of rehearsal e.g. lyrics learnt etc? Appeared ready and prepared to play? How unique did the songs sound? Did the songs fit the set? Did the songs fit the genre? Did the band look original? Did the band stand out? Verbal Interaction? Did the band introduce themselves at all? Did the band talk to or with the audience? Physical Interaction? Did the band physically participate with the audience e.g. Eye contact, head nod, acknowledgments, waving, gesturing, dancing with the audience or giving hand signals. Was the band confident in their interaction with the audience? Confidence/Competence. Did the band look at ease while playing? Did the band appear to be able to do what they wanted to do? Set Dynamism. Did the band’s set list appear to play according to a plan i.e. was it well constructed and able to manipulate the audience’s mood? Stage Presence. Did the band use the stage effectively? Did the band appear positive about their performance? Did the band interact effectively on stage? How did the band cope with any problems they may have encountered? Conformance to contest rules. Did the band followed the rules stated in the contest i.e. time limit, profanity? Did the band’s on-stage attitude appear suitable to their genre i.e. were they ‘Punk’ if Punk, ‘Raucous’ if Rock? Did the band show personality on stage? Did the band appear to enjoy what they were doing? Entertainment factor/Showmanship. Did the band entertain? Did one or the entire band display showmanship towards the crowd? No places will be awarded after the 4th place winner. All winners must complete a W9 to receive their prize payout. Prizes will be distributed to the contact person of the band via a check. Payments will be processed and mailed the week following the event. Audio production, including a mic package and FOH PA with a maximum of 5 monitor mixes. The band is responsible for providing all other instruments and required amps. No purchase is necessary to participate in the contest. All participants must be nineteen (19) years of age or older. Prizes are non-transferable and non-replaceable. Hurricanes Bar & Grill, AcropolisRPM or ClubDistrict.com team members are not eligible to participate. All applicable federal and state taxes are the sole responsibility of the winner. The interpretation of rules and eligibility are the sole discretion of AcropolisRPM Hurricanes Bar & Grill. Hurricanes Bar & Grill reserves the right to modify this promotion at any time, for any reason, subject to all applicable regulatory approval, provided that such modification shall not, as of the date of such modification, materially alter or change any participant’s prize previously won. A list with the winner’s names, rules and any associated documents or electronic files (if applicable) will be retained for 30 days in order to resolve any disputes. Participants cannot win more than once. Winners must show their valid picture identification. A complete list of winners will be posted at the conclusion of event. No band, band member or any person affiliated with the band shall engage in, or encourage, any solicitation for votes or favorable scores from judges by offering prizes, gifts, products, services or any other type of incentive (monetary or non-monetary). Violation of this rule will result in immediate disqualification of the band. Artists agree that their name, photo and any information may be used for media and marketing efforts to include but not limited to; direct mail, radio, TV, social media and websites.